"This is Only a Test..."
"If the day is long and your heart is heavy..."
"Life is God's gift to me..."
"God's promises are like the stars..."
"Don't tell God how big your problems are..."
Your support keeps us going. You keep the lights on and the transmitter humming. With your help, we feel ready to take on any challenge or obstacle, and in Western Alaska this winter, we've had plenty of both. We miss our good friend Tom Busch. In the wake of his passing, we've been reflecting on all he meant to the KNOM Radio Mission. Tom's wife Florence sends her appreciation for your cards, letters and prayers. She wishes she could thank each of you in person. We are doing all we can to help her during these difficult times. Please continue your prayers for her. Meanwhile, we remain committed to realizing Tom's dream for KNOM: a complete digital conversion of the radio station, beginning with the construction of an addition to our studio building. With this digital conversion, KNOM would see substantial energy savings and find it easier to maintain critical radio equipment. The cost of the project is estimated to be around $600,000, and we're already off to a great start: donations to the Tom Busch Memorial Fund have surpassed $50,000, thanks to your continued and selfless support. 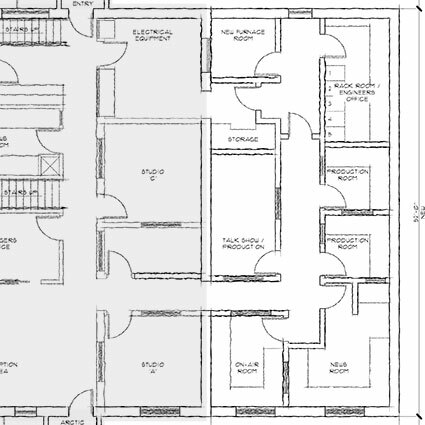 We invite you to explore the pictures and floor plan for our studio expansion below. With your help, we continue to battle the elements and all the challenges of life in our corner of the world. We're so glad you're a part of our KNOM family, and as always, you remain in our prayers. From all of us in Western Alaska, thank you! Building on the inherent strength of our cultural values, we shall assist our tribes and residents to create a positive future. 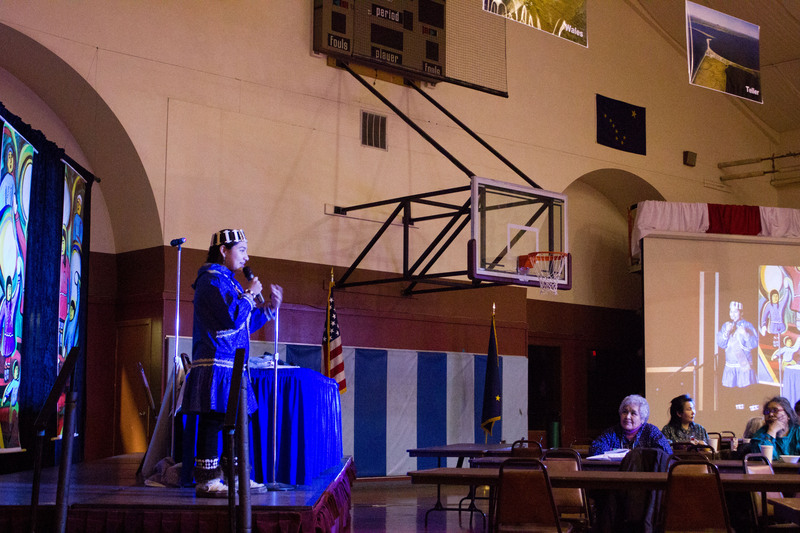 That was the stated vision of the Bering Strait Regional Conference, a gathering of Western Alaskans that took place in Nome over three days in mid-February. The conference - which KNOM was proud to cover - addressed topics that impact our communities, from substance abuse to cold-climate construction. 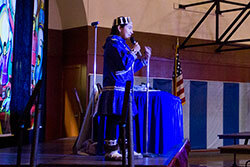 The gathering was also a festive celebration of culture, with Alaska Native music and foods unique to our region, such as reindeer stew and agutuk (uh-GOO-tuck, traditionally a combination of tundra berries and whipped reindeer fat, nicknamed "Eskimo ice cream"). We were able to share the events of the conference with our listeners thanks to your support! 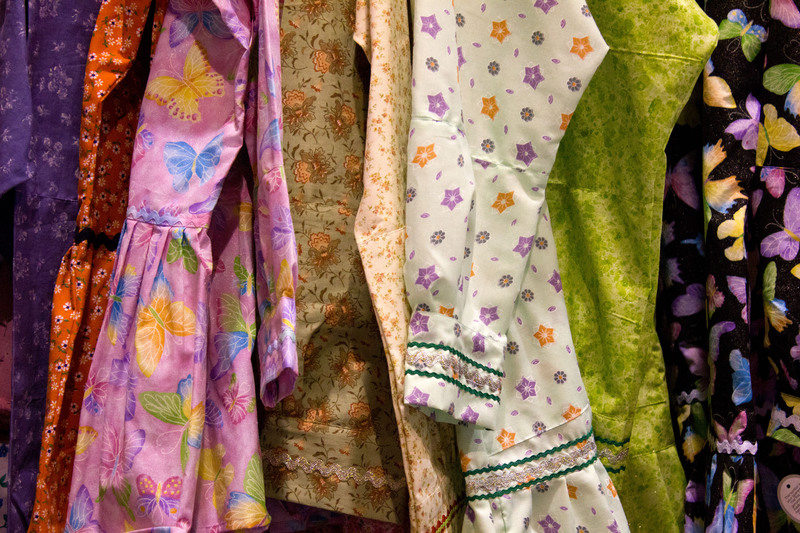 Photos at left: at top, Keynote speaker Marjorie Tahbone stresses education; at bottom, kuspuks (CUSS-pucks), or traditional garments (you'll notice Marjorie's wearing one!). If the day is long and your heart is heavy, remember that God loves you, and remember how much you love others. Love can lift you up. As we go to press, Western Alaska is seeing some of the worst storms of the year. We've been battered by repeated blizzards and winter storms, snow, ice, rain (an oddity for our region in wintertime! ), and fierce winds strong enough to shake and sway Nome's buildings on their foundations. Our relentless February storms have made it challenging, at times, even to go outside, let alone to run a radio station. 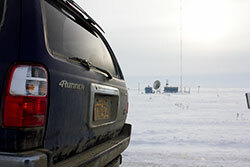 During one of our recent storms – with winds raging at 50 miles per hour and wind chills down to 70 below (-70°) – we noticed that our AM transmitter building, on the open tundra east of town, was getting very cold. 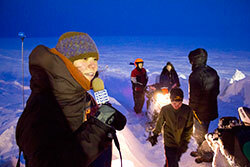 Its indoor temperature (which we monitor via remote in our Nome studios) had dropped to a chilly 43 degrees. General manager Ric Schmidt and volunteer public affairs director Matt Smith immediately dropped what they were doing to make the trek out to the transmitter. After the three-mile drive to the site, they braced themselves for the cold and trudged through heavy snow, gradually crossing the final 400 feet to the transmitter. 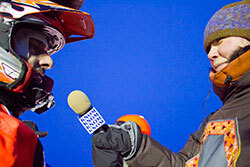 Inside the building, Ric and Matt discovered that the transmitter building's heater had failed. They also found – and fixed – a misaligned filter panel in the door that was leaking extremely cold air. With just the door panel corrected, the transmitter building warmed by 10 degrees, and after the storm passed, the heater was finally brought back online. 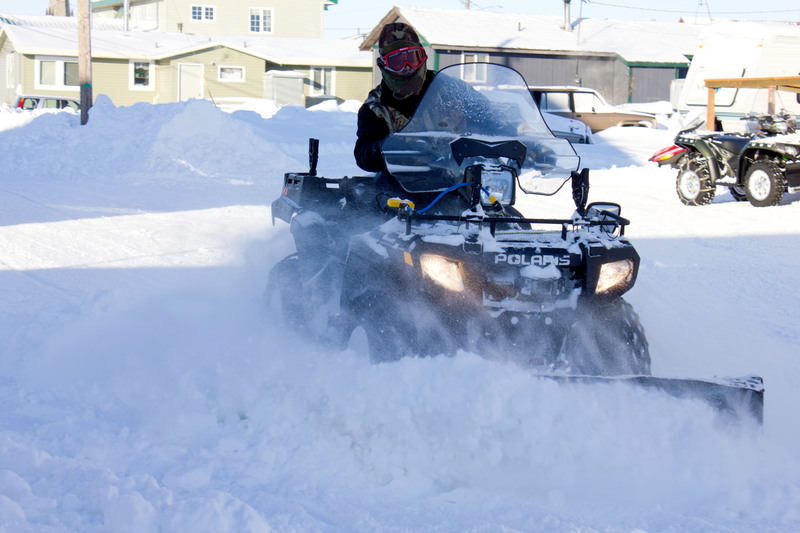 KNOM's continuing operations depend, every year, on the quick action of our staff and volunteers, like Matt and Ric, as well as on the generosity of our Western Alaskan community. 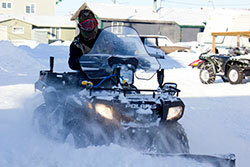 In Nome, we don't have to look far for such support. 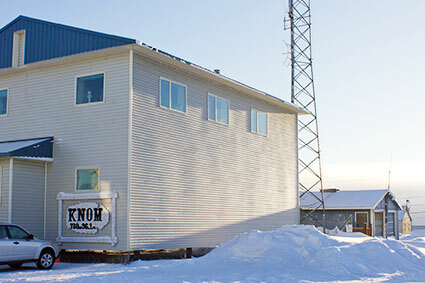 Directly across the street from KNOM studios sits the Nome Community Baptist Church, whose pastor, Bruce Landry, makes a unique contribution to our mission: in the wake of virtually every winter storm, Bruce uses his all-terrain vehicle (ATV, or "four-wheeler") to clear snow from in front of his church and the KNOM building. We thank his selfless support, and yours. 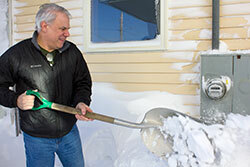 Photos at left: the snowy path from the narrow Nome-Council Highway to KNOM's AM transmitter; Pastor Bruce Landry plows snow after a recent storm; Ric Schmidt tackles a waist-high snow drift next to KNOM studios. Life is God's gift to me. The way I live my life is my gift to God. 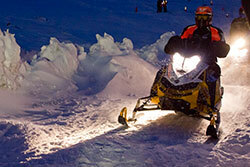 Amid all the ferocity of February's snow and wind (see above), KNOM rallied to cover an event that's very important to our region: the world's longest race for snowmobiles (or, as they're known locally, snowmachines). It's the Iron Dog: a competition of more than 2,000 miles from Anchorage to Fairbanks with layovers in Nome and many villages in our listening area. 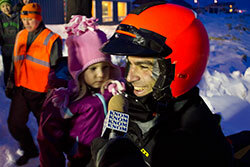 It's a fast race that our audience excitedly follows, especially when Western Alaskans compete. 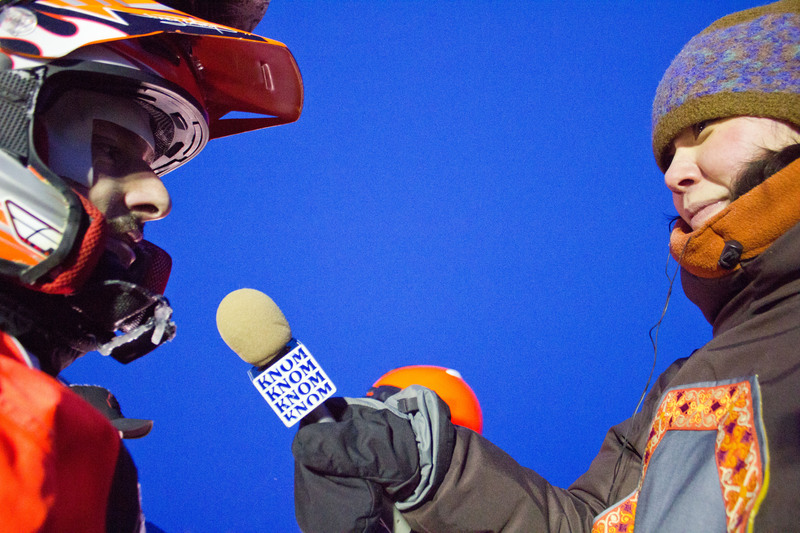 For KNOM, the Iron Dog is also a "warm-up" event for an even bigger, higher-profile competition – the Iditarod Trail Sled Dog Race – which, by the time you read this, we'll be closely covering, thanks to your support. The photos at left are from the nighttime arrival of Iron Dog racers in Nome (the mid-way point of the trail): news director Laureli Kinneen reports from the edge of the frozen Bering Sea, which racers cross on the last stretch into town; racer Marc McKenna (with his daughter) interviews, live, on KNOM; McKenna and teammate Dusty Van Meter pull to a stop in Nome; Laureli interviews Van Meter. God's promises are like the stars: the darker the night, the brighter they shine. On January 26th, at about 10 A.M., KNOM aired a special test of the Emergency Alert System. The test went well, despite an error in the "end of message code" that required us to manually return to normal programming. Even with this glitch, the test was a useful step in broadening KNOM's emergency preparedness: a goal that we take very seriously. In fact, KNOM – alongside other stations in Alaska – is at the forefront of new developments in our national alert system; our January test was an experiment for a new method of emergency alerts that's being tried in Alaska before it's introduced to the rest of the United States. The entire nation is expected to be part of this test at the end of 2011. With your help, we're keeping up-to-date with the latest technology and, most importantly, keeping our listeners safe. As we look ahead to the future of our radio mission, one thing is increasingly clear: our broadcasting equipment is in substantial need of an overhaul. KNOM's studios were built from the ground up using analog technology, which, while perfectly modern in the 1990s, is practically antique in the 2010s. Fewer and fewer engineers still service or repair analog equipment; many pieces of our broadcasting hardware have reached – or exceeded – the end of their expected operational life. The solution is as clear as the problem. 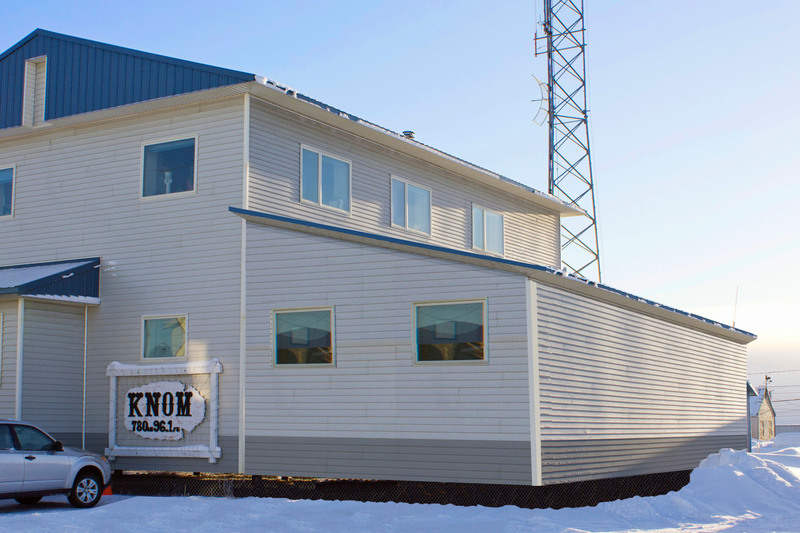 In the very near future, KNOM Radio will be forced to rebuild and expand its studios: transitioning, in the process, to an all-digital operation. 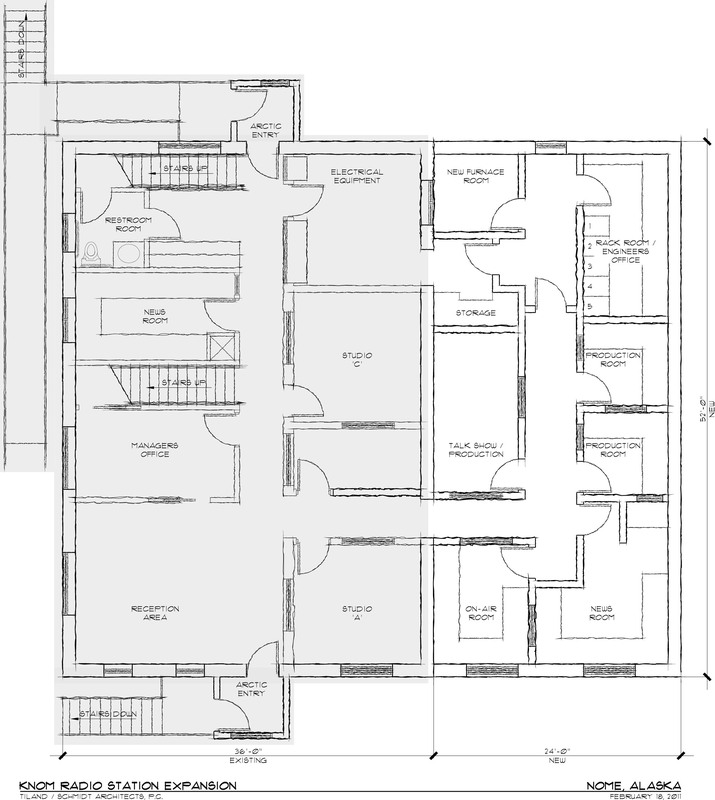 Below is a before-and-after comparison of our current studio building and what it might look like with the new annex. Move your mouse over the image of KNOM's current studio building to see a mockup of KNOM's new addition. 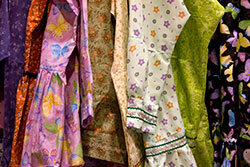 We'd love to hear your comments on this idea; feel free to contact us with your thoughts. The entire cost of the digital conversion and expansion would be about $600,000; we've identified a handful of organizations and institutions that we're hoping can help us defray a large portion of this expense. KNOM's digital conversion was Tom Busch's last dream before his passing in November. We'd love to see it realized, and again, we'd love to hear your feedback. We offer special thanks to Frank Schmidt, of Tiland/Schmidt, Architects, who donated his staff time and materials to create the blueprint and mockup photo. Don't tell God how big your problems are.